Telco giants Smart and Globe Telecom announced recently the release of Apple's latest flagships, the iPhone 5s and iPhone 5c in the Philippines which are available beginning November 15, 2013. The announcement is now making excitement as Smart and Globe create pre-order pages for the "Forward Thinking" iPhone 5s and 'The Colorful" iPhone 5c. Two months after the official launch in America, Filipino iPhone lovers will finally get their hands on the latest smartphones. As of this writing, no details were given on the pricing of iPhone 5S and 5C plans for both Globe and Smart. However, it is assumed that iPhone 5c will be FREE on Plan 1200 or Plan 1500 and iPhone 5s probably be FREE on Plan 2500 for Smart. We'll update the details once officially confirmed. 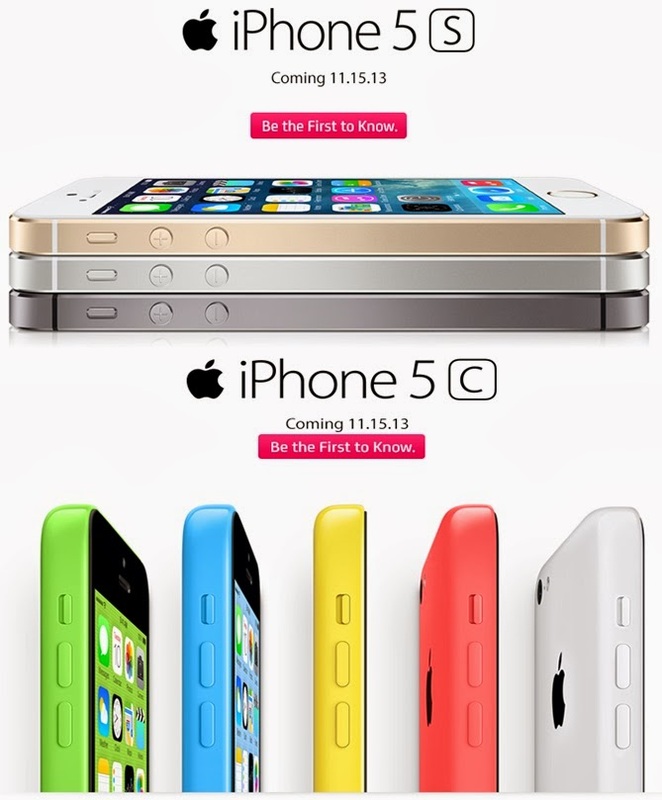 Sign-up now to get iPhone 5s or iPhone 5c from Smart or Globe ( 5s, 5c) or compare the specs first. iPhone 5s comes with iOS 7, the most significant iOS update since the original iPhone, engineered for 64-bit technology and featuring hundreds of great new features, including Control Center, Notification Center, improved Multitasking, AirDrop, enhanced Photos, Safari, Siri and iTunes Radio. iPhone 5s is available in three gorgeous metallic finishes including gold, silver and space gray. To complement iPhone 5s, Apple designed premium leather cases in six rich colors—beige, black, blue, brown, yellow and (RED)—with soft, color-matched microfiber lining. Apple said that iPhone 5s makes it even easier to connect to high-speed networks with support for up to 13 LTE wireless bands, more than any other smartphone in the world. iPhone 5c, the most colorful iPhone yet and the lower price version will be available in five gorgeous colors—blue, green, pink, yellow and white. iPhone 5c is built on a foundation of features people know and love like the beautiful 4-inch Retina display, blazing fast performance of the A6 chip, and the 8 megapixel iSight camera—all while delivering great battery life. It comes with more LTE bands than any other smartphone in the world, a new FaceTime HD camera, and iOS 7, the most significant iOS update since the original iPhone. Those who will adopt the new phone from Apple will be benefitted with the widespread presence of LTE in the Philippines. Long Term Evolution (LTE) is the latest trend and considered as the real 4G technology to provide blazing speed of data connectivity as compared to 3G or HSPA+. Currently, Smart has roll-out over 1000 LTE sites nationwide covering 180 cities and municipalities in Luzon, Visayas, and Mindanao. Smart is the only operator to provide 4G LTE coverage for mobile users in Caloocan, Mandaluyong, Marikina, Navotas, Paranaque, Pasay, Pateros, and Valenzuela. It also covers key areas in Albay, Bataan, Batangas, Benguet, Camarines Sur, Masbate, Mindoro Oriental, Pangasinan, Quezon and Zambales. Meanwhile, Globe Telecom is currently expanding its LTE network to cover more key cities in Metro Manila. At first, Globe has just focused on “large contiguous area” like Makati City. Recently, Globe said that the company has activated more LTE sites and now available also in Pasig City, Quezon City, Taguig, Manila, Muntinlupa, San Juan, and Las Pinas. Globe LTE infrastructure has also been established in Metro Cebu and Metro Davao as well as in select areas in the provinces of Bohol, Batangas, Negros Occidental, La Union, Rizal, Aklan Laguna, Bulacan, Nueva Ecija, Nueva Vizcaya, Cavite, Cagayan, Pangasinan, Isabela, Ilocos, Quirino, Tarlac and in key tourist destination Boracay.